Childhood obesity is a growing problem for our society. However, we are still trying to find effective methods of dealing with this public health concern. Some researchers have suggested that family based interventions could be the most effective way to tackle this issue, as parents can help instil healthy behaviours in their children. However, what if parents don’t realize that their children are overweight or obese? What if they don’t realize that their child is gaining weight at an unhealthy rate? If they don’t realize that there is a problem, why would they seek help? A recent systematic review found that less than half of the parents surveyed correctly identified their children as being overweight in 19 of the 23 studies they examined. So the question then becomes: Do parents only fail to recognize if their own children are overweight or obese, or do they do this for all children? And that is what a recent study by Jones et al, published in the International Journal of Obesity investigated. 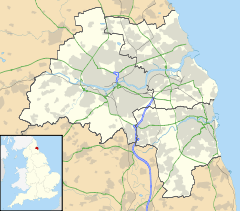 The Gateshead Millenium Study is a prospective cohort study, following children born between 1999 and 2000 in Gateshead in the United Kingdom (see map above). Prospective cohort studies, which are studies where you select a group of people and follow them forward in time and measure health outcomes, are great. You can assess temporality, it minimizes selection bias and you can directly measure all your exposures and outcomes of interest. However, they are very time-consuming, expensive and if you have a rare outcome, you may need to tweak the design to get enough cases. This study had children and parents complete a list of questionnaires, and one of the parent questions asked about their child’s weight status. Focus groups helped assess the reasons behind their perceptions at a societal level – people didn’t have to discuss their own children unless they wanted to. They then compared the child’s actual weight status (normal weight, overweight and obese) to what their parents thought. In their sample, 23.1% of the youth were overweight, and 3.8% were obese. Among parents, 69.3% underestimated their child’s weight and thought they were normal weight. Only 30.7% of overweight or obese children (n = 39) were actually perceived as being overweight or obese. Interestingly, of these 39 children, 38 were considered to be overweight by their parents, while in reality, 26 were obese, leaving only 13 overweight youth. However, despite this, 73.5% of parents were concerned about the rise in prevalence of childhood obesity, although this was not associated with their child’s weight status. This was all from the reported measures. The focus groups revealed some interesting results. Some parents couldn’t define what overweight and obesity were – while they acknowledged it was being in excess of a cut off, they didn’t know what that cut off was, or how it was measured. They also defined overweight as those kids who were “larger than average.” Other interesting attitudes came out, including parents thinking that it was becoming more of a problem, and that it could just be media hype and that it varied depending on where you were. The results from this study are intriguing and fascinating. Again, we see that parents generally underestimate their child’s weight, consistent with the systematic review cited above. What is most interesting here though, is that parents are concerned about the increasing prevalence of obesity and overweight among youth. So even though they recognize it as a problem at the societal level, they don’t recognize it with their own children. Now that we have enough evidence to say, with some certainty, that parents underestimate their child’s weight status, and we know some of the reasons why, we can start to tackle these issues. Educating parents about a healthy weight is an important first step, in conjunction with teaching them appropriate health related behaviours. Hm. Do you know whether they underestimated their child’s weight compared to their child’s peers, or did they correctly estimate their child’s weight but incorrectly class their weight status (possibly with different standards for their own child and others)? So they didn’t ask the question you are interested in. But that would be an interesting question – is it a lack of knowledge about the cutoffs, or underestimating weight? While their research does suggest that these parents do not believe the cutoffs, maybe through educating parents as to how these cut offs are made, these perceptions could be changed.